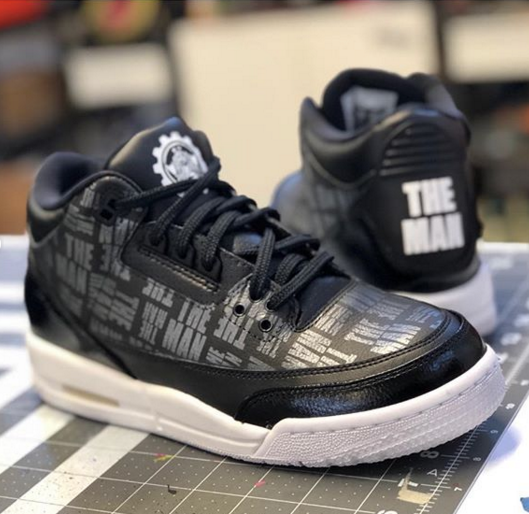 Ahead of Becky Lynch's historic Wrestlemania match on April 7, well known sneaker customizer @Mache275 paid a visit to SmackDown Live to hook her up with an exclusive Air Jordan 3 inspired by her nickname, "The Man." The custom kicks sport a black leather upper equipped with an all-over "The Man" print in gunmetal and black patent leather detailing along the panels. Additionally, Becky's logo sits on the tongue and "The Man" is stamped on each heel tab in white. "The Man" is set to main event Wrestlemania 35 on April 7, along with Raw Women's champion Ronda Rousey and SmackDown Live Women's champion, Charlotte Flair. It will mark the first time ever that a women's match has main-evented Wrestlemania, and Ronda Rousey is taking all the credit for making it happen. The build for their highly anticipated Triple Threat championship match has been in the works for months, and we look forward to "The Man" standing tall at MetLife Stadium next Sunday, regardless of what type of footwear she's rocking in the ring. Take a closer look at Becky's custom 3s in the IG post embedded below.